Several topics, including the Chester Valley Trail, development trends in Great Valley, economic development in the Kennett area, and riparian buffers, were discussed at the Chester County Planning Commission’s fourth semi-annual Planners’ Forum on Oct. 5. The 49 planners who attended heard a range of presentations, which can be viewed in the PowerPoint summary found here. The steering committee for the county’s comprehensive plan update, Landscapes3, began meeting in September with the plan expected to be completed by the end of 2018. More information on Landscapes3 can be found here. The Planning Commission has completed a study on extending the Chester Valley Trail to Downingtown, which will follow the old Philadelphia-Thorndale railroad right-of-way. The plan can be found here. With 35 active projects, there is a lot of development activity in East Whiteland. Three major mixed-use projects—Atwater, Liberty Mixed Use Plan, and Uptown Worthington—are moving forward. Residential development has shifted from single-family detached to townhouses and apartments. Recognizing that economic issues went beyond their borders, Kennett Township and Kennett Square conducted a joint economic development plan. This plan included detailed demographic and market analyses as well as recommendations for developing seven focus areas. Implementation of the plan has begun with the hiring of a joint economic development director and the proposed hiring of a firm to draft zoning changes in Kennett Township. Many communities do not have riparian buffer requirements, and in communities that do have standards, these standards are often too easily waived, have too narrow a buffer, or allow uses, such as lawns and playing fields, that are not ideal. Some of the benefits of having a riparian buffer do not become effective until the buffer is 100 to 150 feet wide. Ideally, exceptional value and high quality streams would have buffers that are 100 to 150 feet in width. The Planning Commission would like to thank Scott Greenly of East Whiteland Township, Lisa Moore of Kennett Township, Ed Theurkauf of Theurkauf Design and Planning, and Vicki Laubach of Green Valley Watershed Association for their excellent presentations. 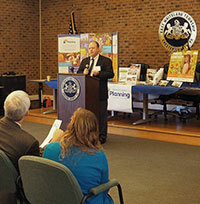 Anyone who is interested in presenting at the spring 2018 Planners’ Forum should contact Planning Commission Executive Director Brian O’Leary at boleary@chesco.org or 610-344-6285.